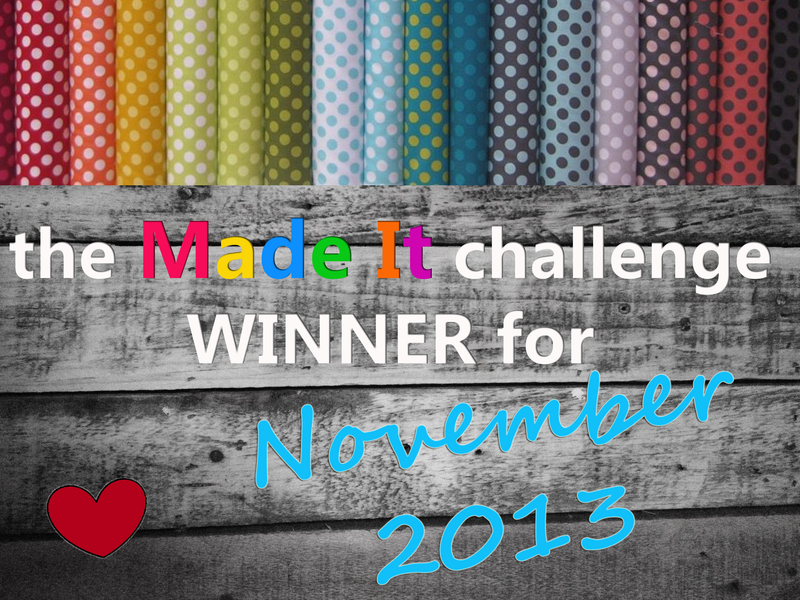 I’ve realised that a few of the things I’ve made this week have been inspired by things others have done. The first thing is one I have seen appearing on several blogs. Have a look here for Rachell’s take on it. This got me to thinking. 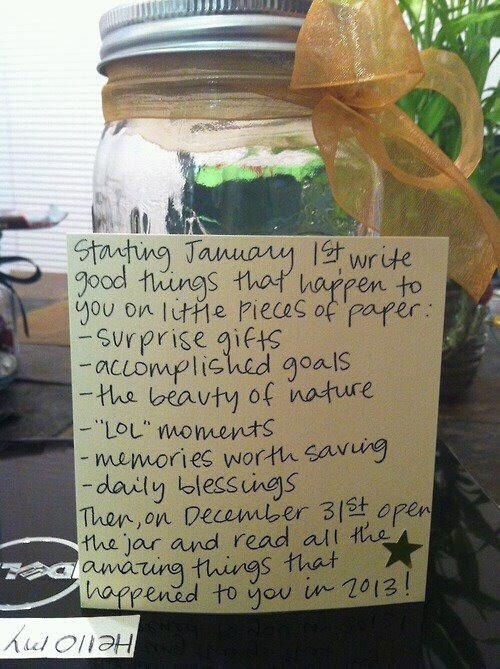 It’s a fab idea, but I’m just not sure that a jar would be big enough. So what I’ve decided to do instead is write a thankfulness list. Each night, before I go to bed, I’m adding things that I’m thankful for. Some things I’m sure will be repeated several times through the year (e.g. time spent with friends, crochet, a good meal, etc.) while others are one offs. I think this may be challenging on the days where everything seems to go wrong, and I end up grumpy and bad tempered. But I also think it’ll be really good for helping me put things in perspective – even when I’ve had a bad day I still have so much to be thankful for! Although I decided against a ‘good things’ jar, I decided that I wanted to make use of a jar in some way. Especially after I saw what Hannah had done for her ’22 before 22′. I loved the idea of washi tape around lolly sticks being used instead of a plain old list – so pretty! This one links in with my thankfulness list. This one might never happen. I hate living surrounded by clutter, but somehow it seems to sneak in without me noticing! But you never know, 2013 might be the year my life becomes clutter free! I added this one because I so much enjoyed the few craft evenings I organised last year. I hope that everyone else will be just as enthusiastic about them! Now, on to the final thing that’s inspired me. The other day, Katherine from Pillows a-la-mode posted about changing her decorations from Christmas to Winter. I thought this was a great idea – why get rid of all decorations just because the Christmas stuff has to be put away? I particualrly loved her garland, which includes trees made from music paper. I have a book that I’ve been cutting up at various points during the last year, and thought I’d make good use of the final few pages by making a new garland for my bookcase. …and the full size bunting strung with fairy lights at the top! The pink ones (see them right at the bottom of this post) are now mine – I just love them, and I have a lot of pink things for them to go with. The rest are now listed on Coriandr. Annoyingly I can’t actually find the post I saw yesterday, but it was a photo frame covered in book pages. 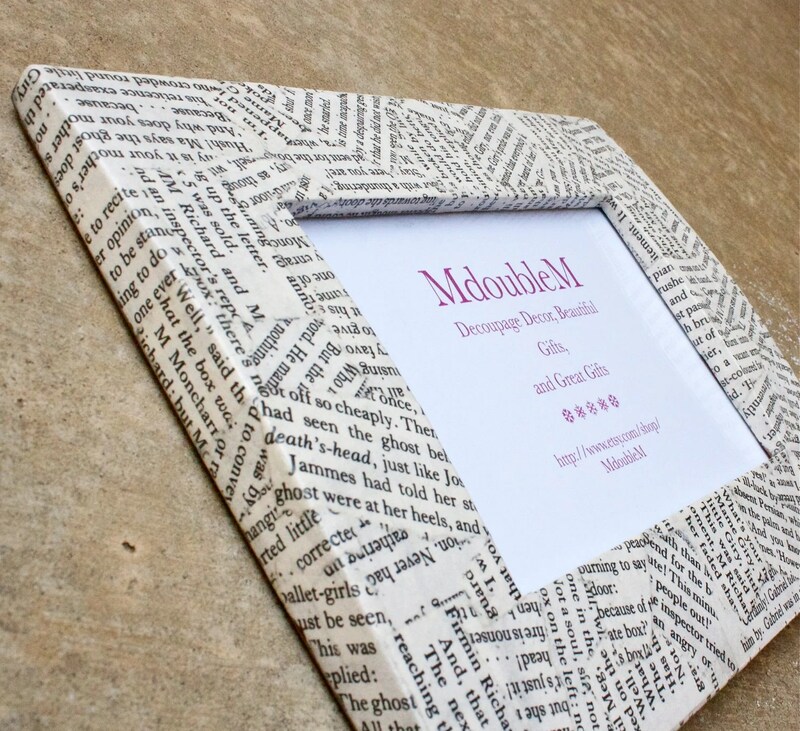 I just love this idea – I’ve always been an avid reader and just love how words look. I know some people would think it an absolute crime to cut up books. In some respects I’m one of those people. But at the same time, if a book is damaged or would just be thrown away, why not give it a new lease of life as something pretty? Anyway, I saw this frame and it gave me an idea. I bought a pin board a few weeks ago with the intention of decorating it and making it look all pretty and lovely. So I decided to do a little papering and covered the frame with book pages. So far so good. I also wanted to cover the back with pages. I know this won’t be seen, but I don’t like the idea of untidy edges, so thought I’d quickly just paper over the back too. Oh dear. Bobbly, wobbly, messy looking paper. What went wrong?! Answer – I have no idea! I’m only using PVA glue, but wondering if I should try a decoupage glue? This is where I need your help – if you’ve done decoupage before, either with book pages or other paper types, is there a particular glue you’d recommend? So pretty! Such a good idea, and so similar to the earrings – I don’t know why I didn’t think of it myself! So this morning I popped down to the supermarket and bought myself a whole load of pins to buttonify. They were drying upside down and when I turned them up the other way I saw all these white bits on them. No idea where they came from – all I can think is that they had some sort of reaction either to the glue, or perhaps to the surface they were on (my sewing machine!). Who knows?! It kinda gives them a distressed look, so think I’ll keep them as they are. I’ve also done a little tidying up this morning. My ‘creative mess’ had got way beyond acceptable and was just getting in the way. I got a couple of cute metal buckets last week from Store 21, and are just perfect for holding all those little odds and ends which might be useful one day, but in the meantime are just in the way. So here we go – no less stuff, but a little more organised! I’ve also started another blanket! I thought I’d finished the hexagon blanket (although it is actually still too small, so I’ll add more to it) and started on a stripy one. I love the easy, repetitive rhythm of half trebles, and although I haven’t got far yet, I can tell I’m going to very much enjoy this latest blanket.